Pizzas to warm your heart. Truly delicious. Good homemade bread, aromatic and dense, topped with pure oils and the best fruits of earth and sea. *** Open Monday - Saturday : 19:00pm-03:00 am . Closed : Sunday . ***Food & Drinks (24h) Delivery Service - TakeawayLanzarote Group | Canarias | Las Palmas. 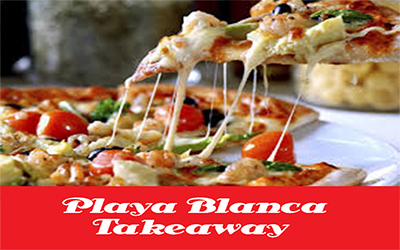 Free Delivery - Playa Blanca for orders over 50€ (Tax and Delivery Excluded). Italian, Canaries, Spanish and much more. Order high-quality takeaway online from top restaurants, fast delivery straight to your home or office.Get amazing food from an incredible selection of local restaurants in Lanzarote.